5 Reasons You Must See Hayden Szeto in “The Edge of Seventeen” | WWAM Bam! Warning – this post includes some mild spoilers. Whenever I think of Hollywood teen movies, I cringe. It’s bad enough that white actors get all the best roles, with almost no exceptions. But a Hollywood teen movie also gave the world one of the most racist, stereotypical portrayals of Asian men ever – Long Duk Dong in the John Hughes’ movie Sixteen Candles. Talk about one enormous “screw you” to the whole Asian community, including the many talented Asian male actors out there who deserve better roles and representation. 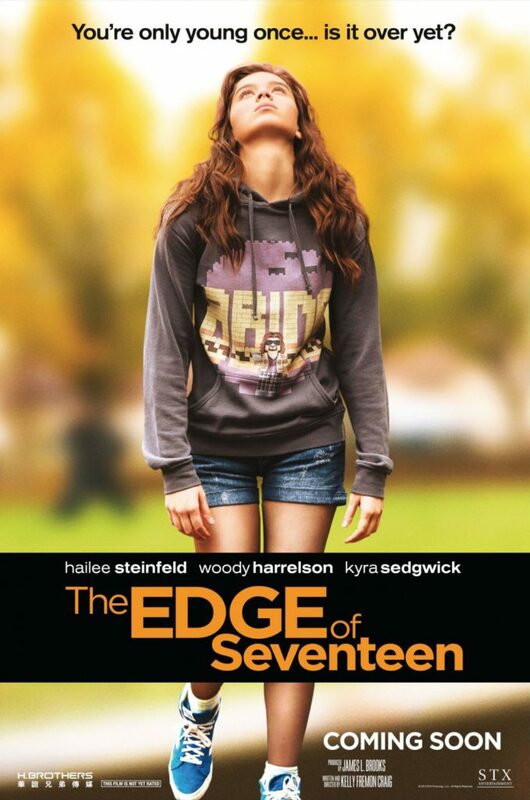 Thank goodness for the new teen movie The Edge of Seventeen, just released in late 2016. The film features one of the most refreshingly unstereotypical portrayals of an Asian man in a teen movie – the breakout role of Erwin Kim, played by Hayden Szeto. And surprisingly, The Edge of Seventeen even shares some common ground with, of all movies, Sixteen Candles (Vanity Fair noted “Steinfeld’s character is derivative of Molly Ringwald circa Sixteen Candles”). Who’d have thought? Hailee Steinfeld is terrific as Nadine. I found myself remembering the loneliness, bullying and funky Converse all-stars of my adolescence. But sometimes her character goes to extremes, such as grabbing her mom’s keys and running off with the car or ditching school. I never would have done that. No, it’s Hayden Szeto as Erwin Kim who shines as the most relatable character in the movie. Who hasn’t suffered through a teenage crush, where you’re kind of nervous and end up botching your moves? Who hasn’t totally tripped over their words publicly? Who wouldn’t jump up and down when the person you love finally wants to come over? He’s not at the parties. He’s the guy sitting on his bed during the weekend, doing his homework and folding his laundry. That was totally me. Teenage love can be embarrassing, but also rife with potential for laughs. Hayden Szeto perfectly captures all of the hilarity of a guy trying to play it cool before the girl he loves. Whether it’s blurting out something bizarre (“Coolio!”) or trying to make up for a really clumsy kiss attempt by unexpectedly raising his voice and asking them to stop the effing ride, Szeto delivers some of the best comedic moments in the whole film. You’ve got a guy who’s handsome (right down to his washboard abs!) and lovably awkward with a talent for drawing and creating cartoons. He even describes himself to Nadine as “just your average guy”. In the normal Hollywood universe, a white guy would have played this role. Instead, they made him an Asian guy. Thank you, The Edge of Seventeen. If you’ve seen The Edge of Seventeen, what do you think of Hayden Szeto as Erwin Kim? If you have to time to waste that was a great movie of a near psychopath teen. Not bad! Are we to take the Asian guy as a necessary distraction? Make up for the boring ‘I-Don’t -Know-Who-I’am-Yet-I’m Clearly-What-You-Know-I’m Who-I’m….’? Thanks for the comment, ordinary malaysian! Interesting thought on the movie. Could be! Regardless, Hayden Szeto completely made the film! Okay I finally finished watching this film. Good movie, totally relatable on my part a little bit with Nadine’s character. I wish that Hayden Szeto’s character had more film time because….that was entirely disappointing.